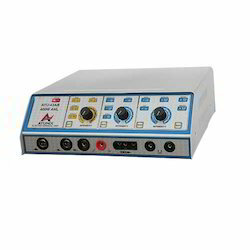 Our range of products include surgical cautery (ayu 400 watt 43ab anl), surgical cautery unit, surgical cautery ayu-400w-anl and surgical cautery (ayu 400 watt 42ab anl). When safety is the prime concern while performing surgery diathermy, then most of the medical experts recommend 400 Watt AYU 43AB ANL. The design of this device allows safety to not only patient, but also to the user who is handling it. Thus, relying on its reliability and durability, it is installed in many operation theaters. The technical ability of Surgical Cautery Unit makes this equipment to be used in surgical diathermy. It basically avoids the possibility of accident by giving safety a prime importance both for user and patients. The unit is newly developed equipment for offering safety and reliability. 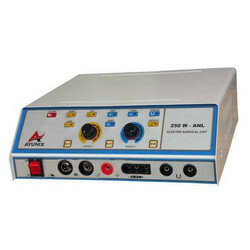 400 Watt AYU 42 ANL is designed by our team to avoid any chances of accident while performing surgical diathermy. Installed with microprocessor control, it shows efficient performance by focusing primarily on safety. 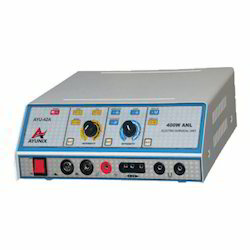 In order to perform safe and sound surgery, many medical experts rely on 400 Watt AYU 42AB ANL. This is designed while giving concern for safety of both user and patient. New in its own kind, this equipment is gaining popularity for its durability and reliability.